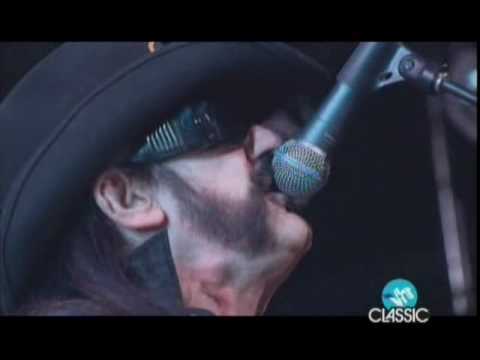 Half a decade before Lemmy Kilmster’s death, the legend led a couple of his famous fans in a run-through of Motörhead’s calling card: 1980’s “Ace of Spades.” At the 2010 Revolver Golden Gods Awards, which focuses on honoring hard-rock and heavy-metal musicians, Slash (on lead guitar) and Dave Grohl (on drums) fueled the tune’s breakneck pace with help from Slash, as Kilmister leaned his head back and growled into the mic. Slash then took center stage for a bluesy, lyrical solo that recalls some of his work with Guns N’ Roses – and suggests the influence that Motörhead’s music had on his style – before stepping back just in time for Lemmy Kilmister to go back into the verse. Grohl, throughout the entire song, is an animalistic mess of hair until the song ends and he and Slash make eye contact and grin at each other, as Kilmister thanks the crowd.